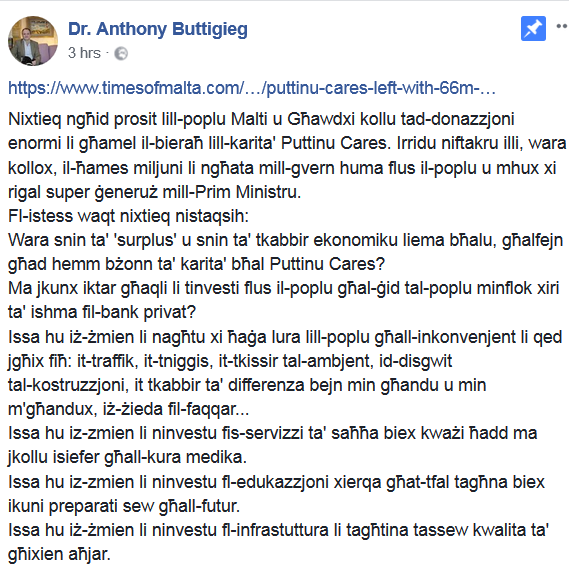 Government’s five million euro donation to Puttinu Cares has created a controversy, and has brought different reactions. When funds were being raised during yesterday’s Xarabank programme on TVM for Puttinu Cares, Prime Minister Joeph Muscat announced that Government would be donating five million euro to Puttinu Cares from the Fund for Economic and Social Development, which contains the monies from the Citizenship Investment Programme. Reacting to this donation, Doctor Victor Calvagna of Puttinu Cares expressed his thanks to the Government, the Prime Minister and the staff at the Prime Minister’s Office for their great assistance to the foundation. Various Labour MPs also welcomed this donation, saying this initiative was a gesture showing a social conscience. 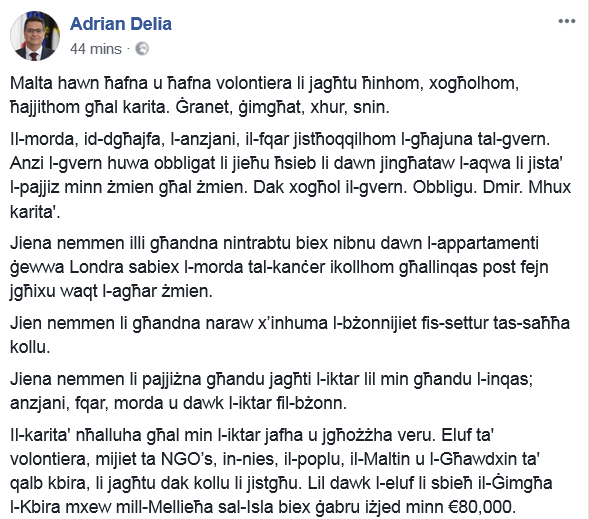 Nationalist Party leader Adrian Delia wrote that the sick, the weak, the elderly and the poor deserved Government assistance, and Government was obliged to care for these persons, and not take care of them through charity. Delia said he believed the London apartments for cancer patients should be built, adding that charity should be left to those who really know it and treasure it. Delia praised those who took part in the walk from Mellieha to Vittoriosa on the morning of Good Friday, during which 80,000 euro were raised. Former Nationalist Party leader Simon Busuttil and Nationalist MPs Jason Azzopardi and Beppe Fenech Adami also reacted to this donation. 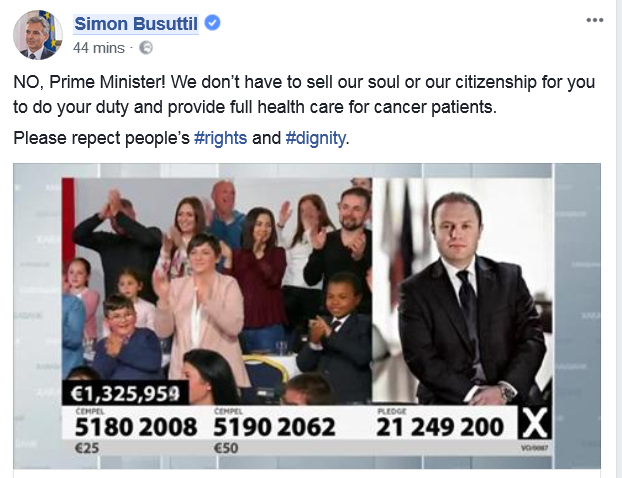 Simon Busuttil said there is no need to sell our soul and our citizenship to provide treatment for cancer patients, and called on the Prime Minister to respect the dignity and rights of these persons. 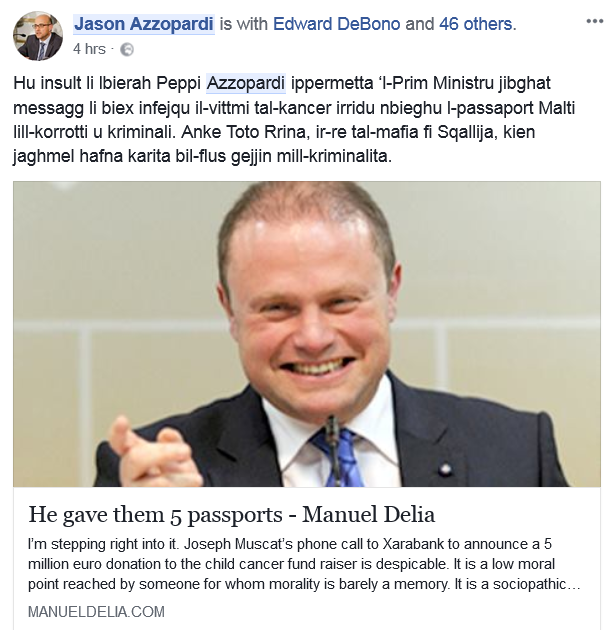 Jason Azzopardi wrote that it was an insult for Peppi Azzopardi to allow the Prime Minister to send a message yesterday that in order to cure cancer victims we have sell Maltese passports to criminals and corrupt persons. Azzopardi added that even Toto’ Riina, the king of the Sicilian Mafia, used to perform works of charity with funds coming from crime. Even Beppe Fenech Adami wrote about Toto’ Riina. Fenech Adami wrote that as one who had spent more than seven weeks being treated for cancer in the UK, he felt insulted and disgusted that the Prime Minister sent a message yesterday that for cancer victims to be treated, we have to sell Maltese passports to criminals and corrupt persons. Democratic Party leader Anthony Buttigieg reacted too, and said the five million euro donated by Government were the people’s money, and not a super-generous gift from the Prime Minister. Buttigieg raised several questions, among them that after years of surplus and economic growth, why is there still need for charity for Puttinu Cares?